We’ve already seen how the Church at Rome emerged to become a headquarters of Western Christianity. We need to spend a little more time here as this period of church history is crucial for understanding the eventual rift that occurred between East and West and what emerged in Europe after this, not only for the Church but for the nations that arose there. The idea of the rule of the entire Church by the Roman Pope was a slow and halting process. The title “Pope / Papa” wasn’t important to the emergence of the Bishop of Rome as the leader of the Church. It was a term of affection used by many Christians for their pastor and was used in a more formal sense in Alexandria decades before it was used of the Roman Bishop. It wasn’t until the 6th C that the word “Pope” was reserved exclusively for Rome’s Bishop, long after he’d already claimed primacy as Peter’s successor. It’s important as well we make a distinction between the honor the Roman church held and the overarching authority its bishop later claimed. There’s ample evidence of the respect accorded Rome’s Christian community. Rome was, after all, the capital of the Empire. The church there was the largest and richest. 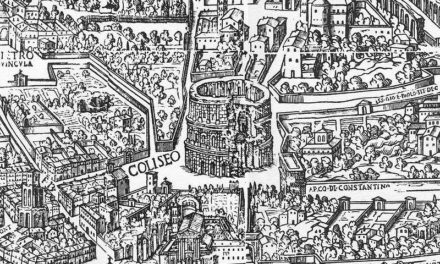 By the mid-3rd C, it claimed some 30,000 members, served by 150 priests, supporting 1500 widows & the poor. It had a long record of remaining orthodox and generous. For these reasons, it was regarded as the lead church of the Western Empire. Though there’s no solid historical evidence to support it, Christians of the 2nd thru 4th Cs believed Peter and Paul founded the church at Rome. It was thought each bishop of Rome handed his authority and office to his successor so that the current Pope, whoever that was, was sitting in the Apostolic seat of Peter. We can see why this would be important to the Church when the Gnostics were a threat to the faith. They claimed to possess special secret knowledge & traditions that had been passed on by Jesus to the apostles, then to them. In contrast to this fiction, Rome could actually name their bishops all the way back to the original apostles. This list was memorized by young believers like state capitals are memorized by students today. While the church at Rome was regarded with great respect by most believers, this honor didn’t always extend to its bishop. There’s much evidence of church fathers, like Irenaeus & Cyprian who disagreed vehemently with positions taken by the bishop of Rome. Until Constantine, there’s no evidence the church at large took direction from Rome’s lead pastor. It’s important at this point to speak about the changes that took place in the structure of the churches during the 3rd & 4th Cs. This change came about for 2 reasons: Councils & Arch-bishops. The first development that led to an alteration in the way churches developed was Church Councils. As the Church grew & individual congregations developed in more places, leaders of the Church recognized the need to coordinate their efforts & teaching. The emergence of heretics prompted elders and pastors to gather to discuss how to address the challenge of false teaching. These gatherings were at first informal and irregular, called at random by provincial leaders. In the 3rd C they began meeting annually in more formal Councils to share news and establish policy that would be observed in each church. These provincial councils proved so helpful, in the 4th C several provinces started sending their bishops to larger regional councils. When Constantine became Emperor and the churches faced major obstacles, the call was sent out for all bishops to meet. The first such General or Ecumenical Council was held in 314 at Arles (are-L) although only the Western church leaders were called. The first true all-Church Council was held at Nicaea not far from Constantinople in 325 and dealt with the threat of Arianism. The findings of these General Councils became the rule for the churches. The 2nd development that helped shape the Church was the emergence of archbishops. During the provincial and regional councils, all bishops were supposed to be equals. But in practice, some of the older bishops and those who lead larger, older, and more respected churches were held in higher regard. Also, as the Church grew it tended to locate first in urban centers, then reached out to the surrounding rural countryside where smaller churches sprang up, usually led by pastors sent out by the pastor of the nearest urban center. It was natural these rural pastors looked to their sending-church as their spiritual home and their sending-pastor as their spiritual leader. In other words, rural bishops looked to urban bishops as an arch-bishop. He might, in turn, look to some other bishop of an even larger city closer to Rome, Alexandria, Antioch, or Constantinople as his spiritual overseer. So, while all bishops were theoretically equal, practically they related to one another in a more hierarchal way, a hierarchy based on the size and prominence of the church and city where the bishop served. You can see where this is going, can’t you? à Put church councils attended by archbishops together with a Church suddenly given access to Imperial favor and it’s a proverbial Pandora’s box of political scheming. The move of the Empire’s political capital from Rome to Constantinople in 330 shifted the center of political gravity 900 miles East. 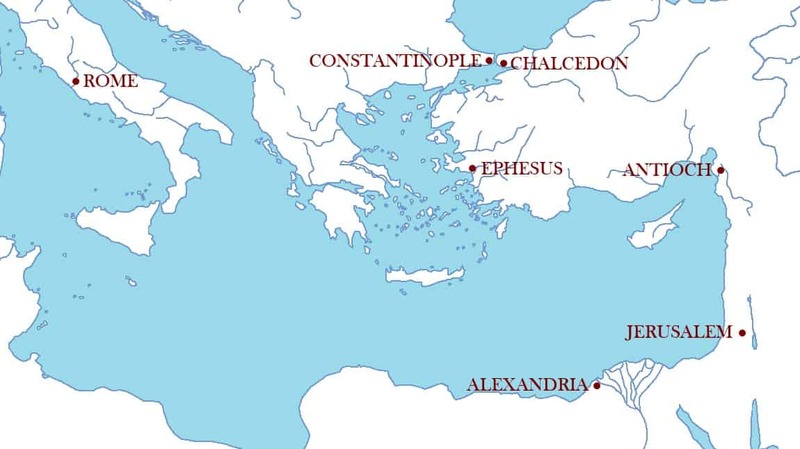 Because location and proximity to political power had become increasingly important, suddenly, Constantinople was added to the list of Christian centers. And the bishop of Constantinople became another major player. Damasus recognize this for what it was, a political power play. He and the other Western bishops responded in their own Council held a year later that Rome’s prominence wasn’t due to its proximity to the capital but its historic connection to Peter and Paul. It was from this Council at Rome in 382 that the Church first claimed the “primacy of the Roman church” based on Jesus’s supposed remark that He would build his church on Peter. It was obvious by the end of the 4th C that East and West were headed in different directions. The Eastern Church with its center at Constantinople became increasingly tied to Imperial power. In the West, things were dramatically different. Imperial power and presence were dissolving. The Church wasn’t only untying from political structures, as those structures themselves dissolved, the Church was increasingly looked to by the common people to provide governance. 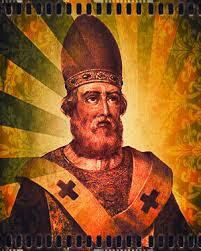 After Damasus, the Roman Bishop most responsible for the emergence of the papal office was Leo the Great. Leo was a nobleman and politician who was made Bishop of Rome when Sextus III died in AD 440. Leo’s 21-year term as Pope saw some of Rome’s most tumultuous years. He drew on themes already in place to support his primacy over the entire Church. Okay. 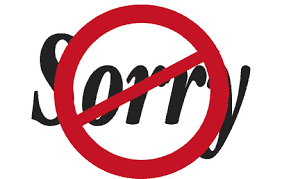 It’s at this point I need to say we’re going to deviate from our usual course & toss out some things that may upset our Roman Catholic friends. But this is a period of Church History that speaks specifically to the issue of the primacy of the papacy. Trust me, when we get to later church history, we’ll have lots of tough stuff to look at regarding Protestants. Leo’s claim to primacy and that the Roman Pope was THE spiritual successor to Peter as leader of the church, based as it was largely on Matthew 16 where Jesus told Peter He’d build his Church on the rock, seems to fly in the face of Jesus’ clear teaching that in the Church the great are not to ape the world’s patterns of power and rule. The great are to serve. As Bruce Shelley notes in his marvelous Church History in Plain Language, the primacy of Peter as leader of the church is difficult to glean from Matthew 16 when just a few verses later Jesus rebukes Peter, calling him “Satan.” Peter denied the Lord at his trial and even after the filling of the Holy Spirit recorded in Acts 2, the Apostle Paul rebuked him for being a poor example. Another reason to question the primacy of Peter and the apostolic succession of the Popes is to ask, where in the Bible does Jesus commission Peter to a role as bishop of Rome? While Peter certainly went to Rome, there’s nothing to suggest he was ever the head of the church there. He was martyred and buried, but that’s a far cry from his ever being a bishop of the Roman fellowship. From a simple historical perspective, until the time of Damasus & Leo, while Rome’s bishop was certainly regarded as A major leader, he wasn’t considered THE Leader of the entire Church. The evidence makes it clear both Damasus & Leo were astute enough to see that with Christianity’s Imperial acceptance power would aggregate in fewer & fewer locations. Those locations were Constantinople, Alexandria, Antioch, & Rome. Rome was the only City in the West, the other 3 were in the East. And with the political center now being in the East, Rome knew it faced the very real threat of becoming irrelevant, as the Church at Jerusalem already had. So the Bishops of Rome played their trump card; they were the one church to whom the names Peter & Paul had some historical connection. In our next episode, we’ll see how Leo the Great helped fix Rome as the center of the Faith. Nice job dealing with the Irenaeus and his position on the City of Rome role in the christian church. This is a good place to include that quote. I think that it might be wise to add a history of the catholic church to the sources you draw on considering the medieval period is fast approaching when the Roman Catholic Church is at it greatest extent in political power. The following looks to be a good one.